Does your institution's website look like a Frankenstein production--a patchwork of templates, designs, and menus that grows unbidden with the addition of new projects? Do staff battle for space on the homepage, resulting in an online presence in which a bevy of barkers distract and mystify visitors who just want to know when the darn place is open? Last week, librarian/techy Aaron Schmidt and his cohorts at INFLUX released the first version of "One-Pager," a one-page library website. Aaron is a UX designer and an advocate for making libraries more friendly, well-designed places. He wants to make library websites more functional through rigorous simplicity, by stripping them of the myriad of program announcements, calendars, catalogs, and other detritus that can confuse and frustrate users. Enter One-Pager. It's a library website that focuses on one core user activity: searching. While it offers modules for library hours, upcoming programs, and other custom content, One-Pager presumes that the majority of library website visitors are coming to the site to search for materials and puts that activity front and center. One-Pager prioritizes simplicity--both for library patrons who use it and for librarians who manage it. One-Pager isn't meant for institutions with a team of web developers; instead, it's designed for library systems that have little to no capacity to write and design online content. The argument is that instead of offering inadequate, unclear, or poorly-designed online services, it's better to offer users something clear, attractive, and easy to maintain. The site is optimized for speedy use on mobile devices as well as standard web browsers. It forces librarians to pare down their content... like it or not. Would museum websites benefit from the same rigorous paring down? I'm of two minds on this. A small, flexible, attractive website would be ideal for an institution with no technical staff that focuses on informing visitors about the onsite experience--and there are lots of museums in this boat. Regardless of the size of the institution and the number of programs and collections supported, many museum websites offer a dizzying number of menus that filter program information by content, experience, audience, or all three. It's not unusual to find museum sites in which the education, exhibit, collection, and basic visitor information are presented in entirely different (and incredibly confusing) templates. On the other hand, museums are more experiential than libraries. There's no base-level service that museums offer the way libraries offer access to informational materials. Some museums (mostly big ones) have made significant investments in online experiences that evoke the onsite experience, and a generic website might not "sell" the museum the way a more immersive one can. The best path is probably to do both: to be as rigorous as possible at paring down and clarifying online content, and then to wrap that content in a design that uniquely reflects the spirit of the institution. Most museum websites do neither; efforts to distinctively design museum websites are often undermined by the sheer volume of content presented, and departmental turf wars trump visitors' need for clarity. Museums do a good job creating singular designs for individual project websites, but when it comes to a whole institution, it's often impossible to focus. 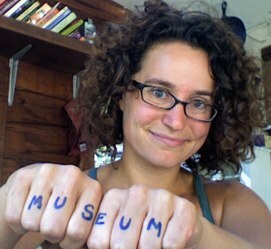 If you were going to arrange your museum website around one thing, what would it be? Is it possible to do so, or does your institution offer such fractious experiences that a sprawling website is the only option? I encourage you to play with the One-Pager demo and imagine what the museum version might look like. A warning: at this early stage of its development, One-Pager is not as easy to deploy as it could be. While the source code is free, One-Pager is not yet tied to a content management system, so inserting new content into the various modules is arduous. The team is hoping to work with a client (or several) to rework the code for Drupal or Wordpress so it can be a more plug-and-play installation over time. In the meantime, feel free to download the code and experiment on your own. And let them know what you think--I know they're interested.